We've been raising tadpoles again this year, with much better success than last year. Here are some simple steps to raising tadpoles in the classroom. More information can be found at the NatureNorth page. 1. Check out your state's rules for tadpoles. 2. I never really gather tadpoles myself...they always just show up. 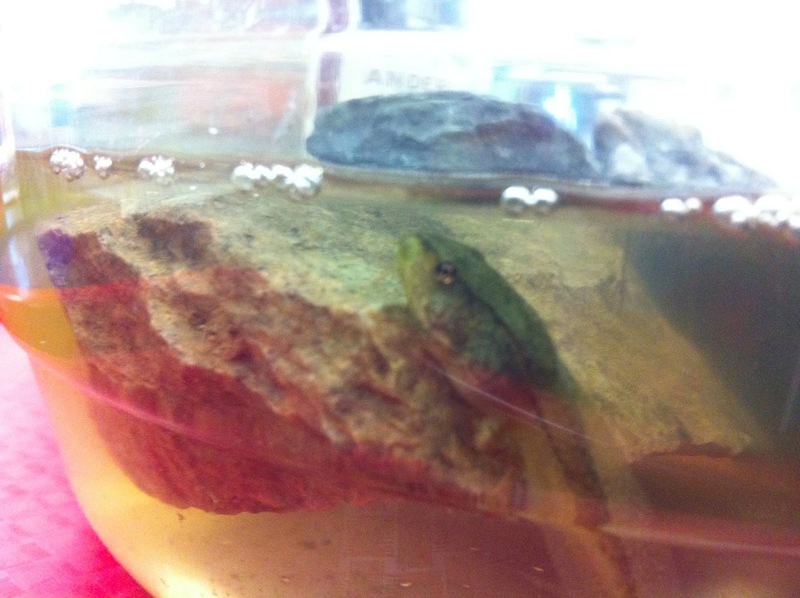 This year, the tadpoles were brought in by a student, and she will take them home later. Wherever you get the tadpoles, it's important to collect a good amount of water for them. I always have the best luck using water from the tadpoles' ancestral home. 3. The best container ever for tadpoles? Plastic pretzel containers! Rinse them very, very well to be sure that there is no salt in them. Then put your tadpoles in, along with the water that you collected from their original home. (Never use water straight from the tap.) The tadpoles don't need very deep water. A few inches at the bottom of the plastic container is fine. 4. Feed your tadpoles bits of cooked lettuce. I just cover some lettuce with water and boil in the microwave for a minute or so. I let the lettuce cool for a few hours and then put it in with the tadpoles. -Every day or two, take out the old lettuce as it starts to decay. -When the tadpoles start to grow legs, put some rocks in the water for them to crawl out on. This tadpole came along in an algae-filled bottle of pond water that another teacher brought to me. (Thanks, Kelly!) I thought it might be a bullfrog tadpole that had overwintered as it was much bigger than any of the other tadpoles. 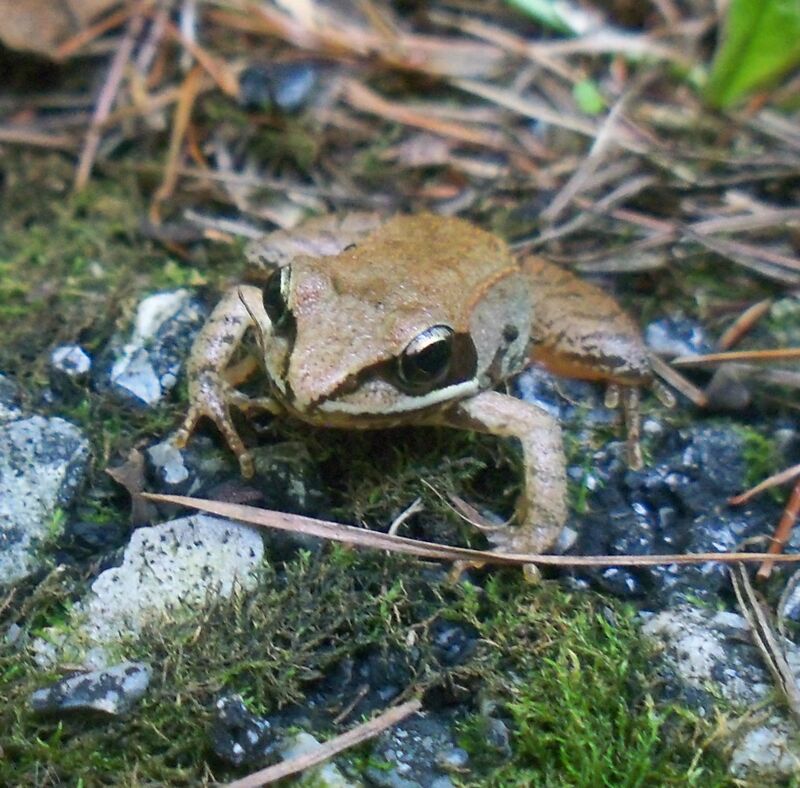 When it fully transformed, however, it was obviously a wood frog--right down to the tiny black mask that is so characteristic of wood frogs. What a neat surprise. The kids had read about wood frogs in the Chronological Order texts activity, so they knew how to recognize it. Just like with spring peeper tadpoles, the full-grown frog is actually a little smaller than the tadpole. This is a good scientific lesson, because it shows how we need to make observations and be ready to change what we think we know. A similar surprise happened with what we thought was a salamander larvae, because it had external gills. As it turns out, spring peeper tadpoles have external gills for a few days. This is the hardest part of the process. In years past, we have not been able to figure out what kinds of tiny insects to give our froglets and toadlets. I always tried to release them quickly after they transformed. 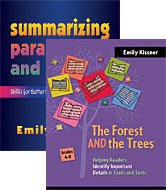 A student and her father discovered a solution last summer. We live in orchard country, and the student's father found that fruit is the key. The froglets don't eat fruit, of course. But the fruit attracts tiny fruit flies...just the food for a tiny froglet! He also found success with aphids from tree limbs. Today we made a new home for our wood froglet, complete with mulch, a water dish, and moss. Hopefully the froglet will thrive until the end of the year. The table of tadpoles is just a quiet hub of activity for the last two months of school. Kids check in on them every day and talk about what has changed. There is always something new to see or discuss, and always tadpole care to manage. As our own little classroom star becomes the supernova of brilliant May, the tadpoles give us one last long project to share together.